The Araneomorphus, or better known as the Araneo or even simply the Spider, is one of the creatures in ARK: Survival Evolved. I don't know where to start with Araneomorphus amalgotantibus. It has so many of the nightmare inducing traits of spiders from among many family and genus. It fires webbing like a bola spider, it spits venom like a lynx spider. It has a poisonous bite like a myriad of spiders, and can see in the dark by sensing vibrations. And to top it off, Araneomorphus is larger than an adult human! If that wasn't enough, I'm convinced that some of the caves on the island have actually been dug by Araneomorphus, but this worries me. Either Araneomorphus is a colony-spider (like ants), or there is a much larger Araneomorphus somewhere on the island. Due to their aggressive temperament, the Araneomorphus will attack the survivor on sight. Like most spiders, it produces webs to snare its food and uses venom to subdue them; however, rather than building elaborate webs, the Araneo opts to shoot webs and spit venom at its prey. They are most commonly found in large swarms deep underground. Found deep underground in dark caverns, or in the lava biome of Ragnarok, the Araneomorphus is a nightmarish chimera of various spider species. This section displays the Araneo's natural colors and regions. For demonstration, the regions below are colored red over an albino Araneo. The colored squares shown underneath each region's description are the colors that the Araneo will randomly spawn with to provide an overall range of its natural color scheme. Hover your cursor over a color to display its name and ID. For example, "cheat SetTargetDinoColor 0 6" would color the Araneo's "thorax and head" magenta. Araneomorphus is tamed non-violently, rather than through the use of tranquilizers. Since it is a naturally aggressive creature, you must first apply Bug Repellent in order to keep it from attacking on sight. The Araneo will not be tameable if it is trying to attack another creature or is feeding on a corpse, so you must either remove any such distractions from the area or lure it to a more secluded area. Once you have the Bug Repellent applied and distractions dealt with, place the food you wish to feed it in the right-most slot of your hotbar. Then, carefully approach the Araneo until a button prompt to feed it appears - it will eat the piece of food you give it and a taming bar will appear. It is recommended that you do so in the prone position to reduce the chance of it noticing you and becoming aggressive. You must then wait until it becomes hungry enough to be fed again, and repeat the process. If you accidentally get too close and touch the Araneo, it will become aggressive and attack. In order to continue taming it, you must get far enough away for it to lose interest in you. Once tamed, the Araneo can itself become a useful tool for taming because of its web attack. Survivors can use this attack to slow down a target animal, rendering it far less dangerous and more manageable. Most times of the year, the Araneomorphus can be found only in caves. However, during the ARK: Fear Evolved event, the Araneos spawned in various places above ground. This section describes how to fight against the Araneomorphus. 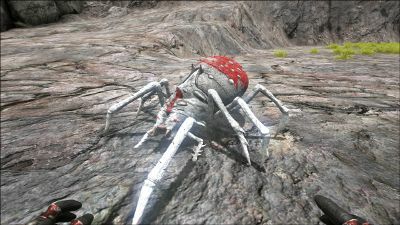 The Araneo is found in caves and has tranquillizing venom, but to a sufficiently equipped player, this is generally not an issue. They have relatively low health and rely on swarming their opponent to overwhelm them with web and venom attacks. Be careful to avoid their ranged attacks. The web attack impedes your mobility and can leave you vulnerable to ambush by other cave predators. Stay nimble and fight back using a ranged weapon, such as a Crossbow. Pikes and Swords can also work in a pinch, but leave you more vulnerable. Most weapons are fairly effective against the Araneo, with ranged weapons being the most effective. However, most ranged weapons will be incapable of putting down large rushes sufficiently quickly, making a backup melee weapon a necessity. Pikes and Shotguns are effective, as the Pike can keep them out of attack range reliably while dealing substantial damage; the Shotgun, on the other hand, can quickly slaughter the Araneo in tight spaces. The largest danger the Araneo presents is the size of its horde. A single Araneo and its ranged attacks can be a challenge, deadly even, but a swarm can quickly overwhelm even the strongest survivors if they aren't paying attention and get cornered. Watch your Torpor carefully and have an ally nearby if possible to cover you if you fall. Cave walls frequently create close quarters, so Shotguns are highly effective. Tamed creatures can be a great help for taking on the Araneo - but which ones can be used depends on the size of the cave entrance. 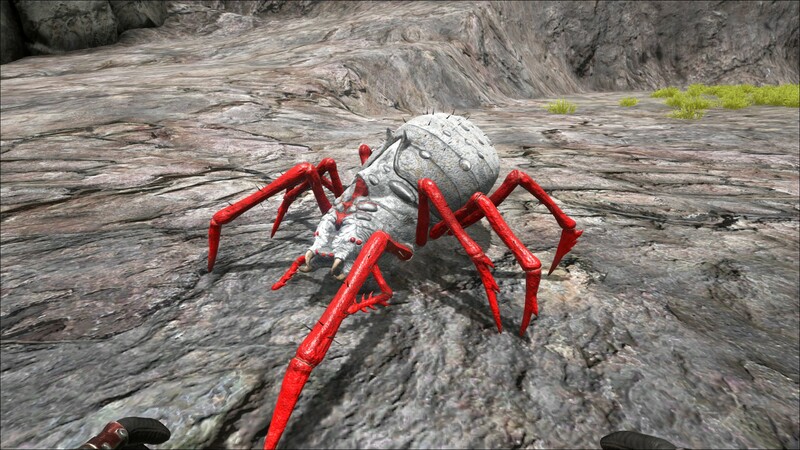 In larger caves, creatures like the Raptor, Sabertooth, Direwolf, and even Pteranodon can be used. In other caves, only shoulder-mounted animals like the Dimorphodon can be used. Cave mount: When mounted on an Araneo you don't aggro any creatures. That makes this tame ideal for caving. Even when attacking most creatures won't aggro on you. This might be a bug. The Web attack can actually have it's damage increased if melee damage is increased. The Dossier for Araneomorphus mentions a "much larger Araneomorphus somewhere on the island"; this actually refers to the Broodmother Lysrix, one of the bosses in the game. Although usually only found in caves, they can sometimes appear in groups on the surface due to a glitch. Despite the Dossier saying that they are too small to be used as mounts, they were made rideable in Patch 221.0. Though the Dossier states they have a "poisonous bite" that is technically incorrect as it would be venomous, not poisonous. Venom is injected, while poison is ingested. Araneae is the scientific name for spiders, the Latin root morphous means "to have the shape of something," amalgam refers to a mixture or combination, and tantibus is literally the Latin word for "nightmare." So Araneomorphus amalgotantibus roughly means "spider-shaped nightmare combination" in Latin, referring to the fact that it possesses features from numerous different families and genera of real-life spiders and that the Dossier describes it as being "nightmare inducing." There is a common glitch while walking up inclined hills or ramps, as Araneomorphus will usually lean forward and perform a sort of "hand-stand," while their faces clip through the ground. Additionally, they appear to lack a swimming animation, as their walking animation is used while swimming. It is possible that all Araneomorphus are the children of the Broodmother Lysrix.